CNN's Android app for smartphones lets users upload content for CNN's iReport. (CNN) -- CNN on Tuesday announced the release of its app for Android phones, highlighting an "immersive" news-reading experience and the ability for users to create their own stories and share them from their phones. The free app, available in the Android Market, provides access to a broad cross-section of the network's reporting, from live field reports and in-depth enterprise pieces to podcasts and user-generated content. "Android users are extremely discerning and will accept nothing less than a first-rate app that showcases high quality, world-class content -- and enables them to share it," said Louis Gump, vice president of mobile technology at CNN. "We built the CNN app with these desires specifically in mind and are excited to offer the millions of Android phone users around the world access to CNN's global reporting." The smartphone offering joins CNN's app for tablet computers that run on Google's Android system. In February, CNN became one of the first companies other than Google to release an app designed specifically for Android tablets. 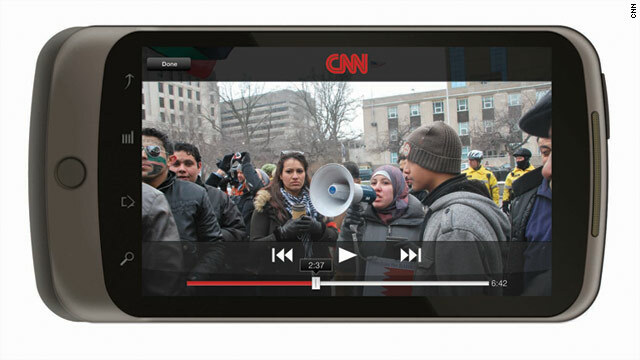 CNN's Android tablet app, like the smartphone app, takes advantage of the camera on most Android devices to let users submit videos and photos to CNN iReport. "CNN for Android is one more evidence that no one can ignore Google's platform anymore," wrote a blogger at the site TheNextWeb. App users can share text stories and photos via e-mail, Facebook and Twitter. A widget enables users to view top headlines without opening the app. The blog AndroidCentral gave the app a generally favorable review but said the amount of information presented is almost too much. "The application is as intuitive as it is overwhelming. You're greeted with a host of news in a number of categories -- top stories, U.S., world, politics, justice, entertainment, tech, health, living, travel and opinion -- and those are just for CNN's Lindsay Lohan coverage. (Zing! )," the blog wrote. With 46 reviews on Google's official Android Market as of noon Tuesday, the CNN app had earned an average 4½ of 5 stars. "This is perfect!! So much content to view. It looks like there will always be something to view. Exilent UI, very nice," wrote one reviewer. "Its about time!" wrote another. "Heavy on decoration and loading. Wish they'd let us manually update or choose update intervals. Still well done app," a user wrote. For more details, visit cnn.com/android.